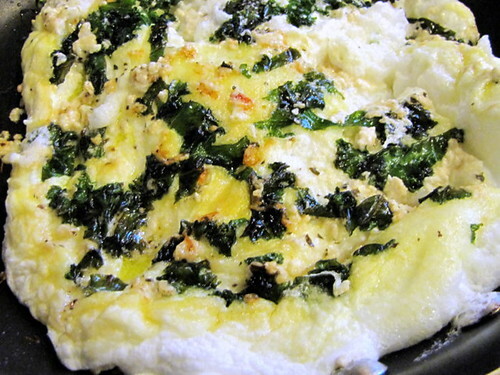 Fluffy Egg White Omelet with Feta and Kale ~ I Can Do That! I have lots and lots of egg whites, I'm practically swimming in them. I already used up some for meringues but didn't want to make any more sweet things that would probably add inches to my expanding waistline. Then I remembered the fluffy egg white omelet I made 2 years ago, so for early dinner I whipped up a light airy protein-rich omelet that is nowhere near boredom city because it's filled with farmer's white cheese, salty tangy herbed (basil, rosemary, dried tomato) feta cheese, and my current favorite green leaf vegetable, kale. I love the combination of the salty cheese and the nutty vegetable and will definitely have this for dinner again. In the bowl of standing mixer with wire whisk on medium speed, beat egg whites, lemon juice, and salt to soft peaks. In a large skillet, heat half tablespoon oil over medium heat and saute kale for 2 minutes or until soft. Transfer into a small plate. Add the rest of olive oil, then add beaten egg whites. Cook for 2 minutes. 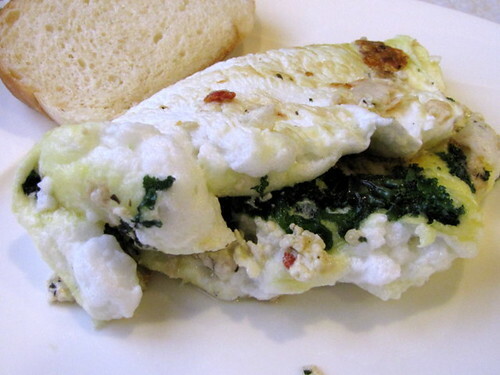 Flip the egg white and cook for 1½ minutes. Flip once more then sprinkle the cooked kale and cheeses evenly on top. Fold and transfer on a plate. Serve immediately. I'm the opposite at my house. I always have a lot of egg yolk. Want to trade? Joy, heheh, we're like Jack Spratt and his wife.